District 22 is comprised of Lakeside, Jurong, Boon Lay and Tuas which are all located west of Singapor. It is densely populated with many industrial buildings, all funding the nation’s economy, but it also has residential estates and landscaped parks. Jurong is Singapore’s industrial area, where its large working population is housed in a mix of old and new housing estates in Boon Lay, Taman Jurong and Hong Kah areas. With development plans for a new commercial hub, Jurong is famous for the Jurong Bird Park, Singapore Science Centre, Chinese and Japanese Gardens as well as JCube Ice Rink. Although the Singapore-Kuala Lumpur High Speed Rail terminus is expected to be completed after 2020, it has already affected the property prices in Jurong where some property value is already up by 1 percent and is projected to steadily rise to 5 percent. In addition, Jurong is scheduled to be Singapore’s second Central Business District (CBD) where more manufacturing businesses, schools and entertainment outlets are expected to boom in the area. Here are some recent residential launches that will appreciate in value that are appealing to locals, foreigners and investors looking for homes in Jurong. There are many shopping malls in Jurong and some popular ones are Jurong Point Shopping Mall, Pioneer Mall, International Merchandise Mart, JEM and Westgate. Hungry stomachs can have their fill in Jurong’s popular food centres like NTI Foodcourt, Jurong West Market and Food Centre, Boon Lay Place Market and Food Centre, lastly, Yuhua Market and Food Centre. There are plenty of MRT Stations to cater to Jurong’s resident such as Jurong East, Chinese Garden, Lakeside, Boon Lay, Pioneer and Joo Koon. Named after Chew Boon Lay, a famous landowner in the late 19th century, Boon Lay district was inundated with his rubber plantations when it was just a wasted swampy jungle. Later, with its first factory, the National Iron and Steel Mills, it turned into Singapore’s first industrial estate. There are many factories in this area and some old factories are under plans for redevelopment for transformation to modern high-density factories. The world’s largest chocolate company, Barry Callebaut, can be found here. Currently, the latest HDB offerings are Boon Lay Meadow where a total of 705 flat units are up for grabs, whilst more residential projects are being planned in this area. However, a super industrial development located at Sunview Road, Eco-Tech @Sunview would be constructed to fill in the demands of business entities waiting to invest in this area. A 9-storey building with 424 individual units and a spacious canteen, Eco-Tech @Sunview is a good mixture of retail, office, hotel, entertainment and F&B. Conveniently connected with Pioneer, Lakeside and Boon Lay MRT Stations, with Singapore’s reliable bus service, getting around Boon Lay should be easy. Tuas is an area completely dedicated to heavy industries where heavy machineries and equipment is manufactured, as well as the production of chemicals and electronics. Located at Singapore’s west side, workers have to commute to and from this area in order to go home. On the bright side, public transportation is convenient with feeder bus services ferrying workers every day from Tuas to nearby MRT Stations in Boon Lay, Chinese Gardens and Jurong East. 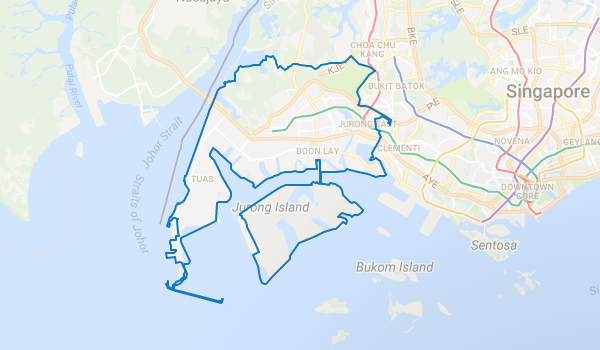 There are only a few designated industrial parks here such as the Tuas Biotechnology Parks with factories housing many Multi-National Corporations (MNCs), Singapore Tin Industries and Tuas Incineration Plant. Incidentally, Tuas have the largest and most significant recreational club located on its coast - Raffles Country Club that has a large golf course. Tuas is also the country’s gateway to Malaysia via the Tuas 2nd link, a connecting bridge that makes road travel to Malaysia more convenient. For more apartment/condo for sale in Singapore, visit here. Note: Move the handles on the slider to change the chart's time period. Mouse over or tap on the chart to see more information.